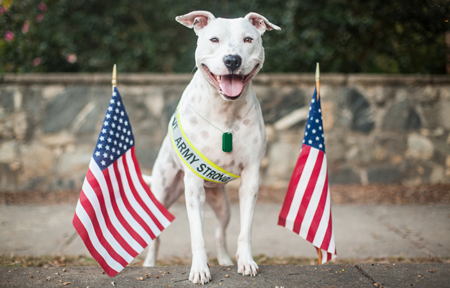 After a spirited debate, the ABA House of Delegates on Monday voted to ask Congress and the Department of Defense to instruct the Armed Forces and its public-private venture housing contractors to implement breed-neutral pet policies for families living in military housing in the United States. Resolution 112, sponsored by the Tort Trial and Insurance Practice Section at the ABA Midyear Meeting in Las Vegas, seeks to eliminate inconsistent breed bans found across military branches. It falls in line with past ABA support of national trends in breed-neutral dangerous dog legislation that target behavior rather than appearance. Andrea Joy Albrecht, a member of the Tort Trial and Insurance Practice Section Animal Law Committee who is also a legislative attorney with Best Friends Animal Society, introduced the resolution. She said she often receives calls from military families who are being forced to give up their dogs due to inconsistent policies in military housing. Marc L. Warren of Washington, D.C., a delegate from the Judge Advocates Association, spoke in opposition of the resolution, arguing that it would erode the authority and discretion of Armed Forces to instill their own orders as necessary. “We should continue to defer to individual services and commanders who can balance interests and constituencies, rather than a one-size-fits-all order from the Pentagon in Washington, D.C.,” he said. Peter Langrock of Vermont also opposed the resolution. He said even though he loves dogs and has two of his own, he questioned whether the issue was germane to the work of the House of Delegates. “Do I go back to Vermont and say I came to Las Vegas to try to tell the military that they shouldn’t control dogs at their base?” he said. James Durant, a delegate of the Solo, Small Firm and General Practice Division, spoke in favor of Resolution 112 for what he called personal reasons: He spent 22 years on active duty, and because of nine separate moves, his sons were never allowed to have a pet. She also said the issue is germane to the ABA, as past president Linda Klein worked to expand services for men and women in uniform, and the resolution is consistent with that initiative. The ABA House of Delegates also previously approved a resolution calling on governments to enact comprehensive breed-neutral dangerous dog laws in 2012. Resolution 112 was approved after a standing vote.